This dip has a serious amount of flavor. It is rich and savory, and sort of insanely intense in the best way, all without the addition of cheese. That's right, WITHOUT cheese. 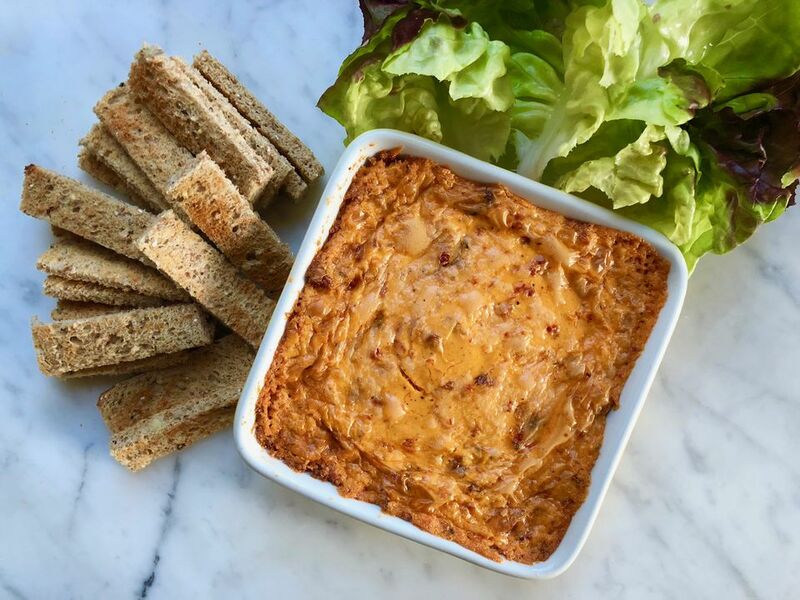 And while it's good on toast points, toast soldiers, or crunchy crackers, this dip comes into its own on fresh and crispy lettuce scoops. That fact isn't surprising: the bacon and tomato in the dip meet the all-important lettuce, melding into that magical BLT zone. For the full BLT effect, scoop up some dip with a toast, wrap that in a small lettuce leaf, and crunch away. Note that the recipe as written below makes a modest amount that serves about 6 people as an appetizer. For a bigger group, you can double or triple everything except the bacon and still end up with a tasty dip. Of course, if you also want to double or triple the bacon, feel free to do so! Cook the bacon: heat a large frying pan over medium-high heat (or bake it in an oven). Add the bacon, reduce the heat to medium, and cook until browned, about 4 minutes. Turn the slices over and continue cooking until the bacon is browned on the second side and has rendered the bulk of its visible fat, about 4 more minutes. You want the bacon cooked so it will be totally crispy once cool, so likely a bit more done than if you were going to eat it plain. Transfer the bacon to a paper towel-lined plate to let drain. Pat off as much excess fat as possible. Let bacon cool. Peel and mince the garlic. Put it in a food processor, if you have one. Chop the sun-dried tomatoes, add them to the garlic. If you have a food processor, pulse the garlic and tomato together, scraping down the sides as necessary. If you don't have a food processor, you can simply mince the garlic and sun-dried together until the form something of a paste. Add the sour cream (or cream cheese) and the mayonnaise to the food processor, if using, and whirl to blend everything. Without a food processor, put the garlic-tomato mixture in a medium bowl, add the sour cream and the mayonnaise, and whisk to combine thoroughly. Crumble the cooled bacon into the dip—really crumble it into small pieces—and stir to combine thoroughly. Add black pepper to taste. Transfer the mixture to a small baking dish. Bake until browned on the edges and bubbling all the way through to the center, 20 to 25 minutes. While the dip bakes, trim off and discard the stem ends of the lettuce heads. Separate the leaves. Rinse the leaves clean and pat them dry. Arrange the lettuce leaves on a serving plate or platter. If also offering the crackers to toast points, toast as needed and add to the platter. If using the cherry tomatoes, add them to the platter as well. Serve the dip hot, with the lettuce and other items.